In other words, an ideal transformer gives output power exactly equal to the input power. The efficiency of an idea transformer is 100%. Actually, it is impossible to have such a transformer in practice, but ideal transformer model makes problems easier. Zero winding resistance: It is assumed that, resistance of primary as well as secondary winding of an ideal transformer is zero. That is, both the coils are purely inductive in nature. Infinite permeability of the core: Higher the permeability, lesser the mmf required for flux establishment. That means, if permeability is high, less magnetizing current is required to magnetize the transformer core. No leakage flux: Leakage flux is a part of magnetic flux which does not get linked with secondary winding. In an ideal transformer, it is assumed that entire amount of flux get linked with secondary winding (that is, no leakage flux). 100% efficiency: An ideal transformer does not have any losses like hysteresis loss, eddy current loss etc. So, the output power of an ideal transformer is exactly equal to the input power. Hence, 100% efficiency. Now, if an alternating voltage V1 is applied to the primary winding of an ideal transformer, counter emf E1 will be induced in the primary winding. As windings are purely inductive, this induced emf E1 will be exactly equal to the apply voltage but in 180 degree phase opposition. Current drawn from the source produces required magnetic flux. Due to primary winding being purely inductive, this current lags 90° behind induced emf E1. 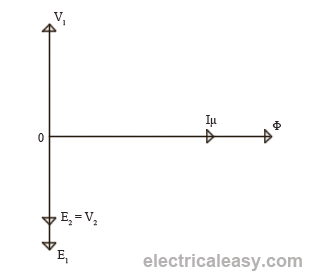 This current is called magnetizing current of the transformer Iμ. This magnetizing current Iμ produces alternating magnetic flux Φ. This flux Φ gets linked with the secondary winding and emf E2 gets induced by mutual induction. (Read Faraday's law of electromagnetic induction.) This mutually induced emf E2 is in phase with E2. If closed circuit is provided at secondary winding, E2 causes current I2 to flow in the circuit. For an ideal transformer, E1I1 = E2I2.